Dial-up networking allows a remote access client to establish a dial-up connection to a port on a remote access server. The configuration of the DUN server determines what resources the remote user can access. Users that connect through a DUN server, connect to the network much like a standard LAN user accessing resources. Virtual Private Networks (VPNs) provide secure and advanced connections through a non-secure network by providing data privacy. Private data is secure in a public environment. Remote access VPNs provides a common environment where many different sources such as intermediaries, clients and off-site employees can access information via web browsers or email. Many companies supply their own VPN connections through the Internet. Through their ISPs, remote users running VPN client software are assured private access in a publicly shared environment. Tunneling is the concept used to describe a method of using an internetwork infrastructure to transfer a payload. IPSec tunnel mode enables IP payloads to be encrypted and encapsulated in an IP header so that it can be sent over the corporate IP internetwork or Internet. Unicast traffic comprises of point-to-point connectivity between TCP/IP systems. Broadcast traffic comprises of point-to-multipoint connectivity between TCP/IP systems. Multicast traffic comprises of point-to-multipoint traffic to a group of selected members that belong to a multicast group. Each of your sites can be connected to a local point of presence (POP) which in turn leads to reduced cost of the leased lines. You can connect to multiple sites using a single frame relay connection. You pay for only the bandwidth that is used. Contracted bandwidth can be exceeded when heavy traffic conditions are present. Leased lines: Dedicated leased lines are also typically used to connect remote networks. While dedicated leased lines are commonly used for WAN links to enable remote network connectivity, purchasing and maintaining leased lines are expensive. In addition to this, you have to pay for allocated bandwidth all the time. This is due to leased lines being classed as persistent connections. This means that the connections are permanent connections, and remain open all the time. Dial-on demand connections: While the WAN connections provided by Integrated Service Digital Network (ISDN) and standard asynchronous modems are typically slower than dedicated leased lines, they can be disconnected at an time, and can also be used to enable connectivity to different locations. One of the main characteristics of dial-on demand connections is that you pay for the actual bandwidth that you are using. Virtual private networks (VPNs): Remote access VPNs provides a common environment where many different sources such as intermediaries, clients and off-site employees can access information via web browsers or email. Many companies supply their own VPN connections via the Internet. Through their ISPs, remote users running VPN client software are assured private access in a publicly shared environment. By using analog, ISDN, DSL, cable technology, dial and mobile IP; VPNs are implemented over extensive shared infrastructures. 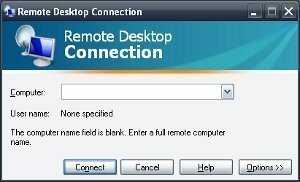 Remote access VPNs offer a number of advantages, including the elimination of WAN circuit and modem costs, cable modems enable fast connectivity and are relatively cost efficient, new users can be added with hardly any costs, and information is easily and speedily accessible to off-site users through Internet connectivity. 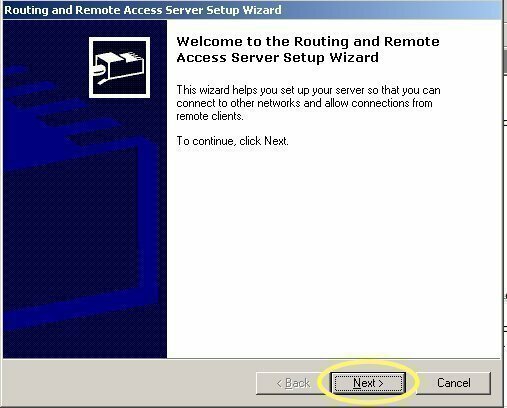 The Routing and Remote Access Service (RRAS) provides multiprotocol routing services for Microsoft Windows 2000 Server and Windows Server 2003 computers. RRAS includes a wide variety of features that support unicast and multicast IP routing, IPX routing, AppleTalk routing, and remote access. Determining the remote access requirements of the organization and users should be one of the initial stages when you plan your remote access strategy. 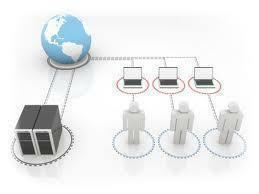 All organizations and all users do not have common remote access requirements. Identify the subnets which will be remotely accessed. Determine the resources which need to be remotely accessed. Determine whether your existing servers can be modified and configured to enable remote access. Evaluate existing modems and connections. Determine what dial-in connection security and VPN connection security mechanism need to be implemented. Determine what operating systems are being used by clients. Determine the computers which are being used by clients. Determine what the bandwidth needs of users are. Determine what connections can be supported. Determine whether clients’ current Internet connections can be used for VPN connections. Determine how often users will need to connect to the network. When deciding on the specific type(s) of remote access that you are going to allow, you have to include the needs of the organization and the users which you have identified. The focal point here is whether the remote access type meets these needs and requirements. Another important factor that should be included when you determine the remote access type you are going to allow is the cost and administrative skills needed to both implement and maintain the remote access type. Modem access remains unaffected by Internet usage. You could use existing modems and phone lines. When high bandwidth is not a requirement, modem access is reliable and its speed is consistent. You do not need to provide encryption. Security features such as caller ID verification and callback security can be used. An unlimited number of connections can be allowed from clients, and over a single connection. You can easily modify existing Internet connections to enable VPN access. If clients can use a broadband Internet connection, more bandwidth is available than that provided by dial-in access. To secure VPN access, Windows Server 2003 provides strong levels of encryption. Wireless remote access: Wireless networks are defined by the IEEE 802.11 specification. With wireless networks, wireless users connect to the network through connecting to a wireless access point (WAP). Wireless networks do not have the inbuilt physical security of wired networks, and are unfortunately more prone to attacks from intruders. To secure wireless networks and wireless connections, administrators can require all wireless communications to be authenticated and encrypted. There are a number of wireless security technologies that can be used to protect wireless networks. When planning wireless remote access, planning security for wireless networks should be a high priority factor. Access network resources and services. Map network drives, and perform other operations, based on the access that is allowed. The Internet cannot be used to access resources on the corporate network because of security issues. The throughput provide by a dial-up connection adequately meets the requirements of remote access clients – they are able to perform the various functions which they need to. The expense of phone lines and modems are affordable. VPN client: A VPN client utilizes the Internet, tunneling and TCP/IP protocols to establish a connection to the network. Wireless client: These clients connect to the network through radio frequencies such as infrared frequencies. Plain old telephone service (POTS): In the early days of dial-up networking, phone lines were used to establish the dial-up connection. The amount of data that was passed was initially limited because analog components caused signal loss. This has since improved with the connections between phone offices becoming all digital connections paths. Integrated Services Digital Network (ISDN): ISDN uses an all digital signal path and includes features such as caller ID, call forwarding, and fast call setup times. Point-to-Point Protocol (PPP): The Point-to-Point Protocol (PPP) uses a three way PPP negotiation process to enable devices to establish a TCP/IP connection over a serial connection. There are a number of protocols that operate above the PPP to enable the PPP negotiation process, such as Challenge Handshake Authentication Protocol (CHAP), Callback Control Protocol (CBCP), Compression Control Protocol (CCP), IP Control Protocol (IPCP) and Internet Protocol (IP). The cost of dial-in remote access increases as more phone lines are added for remote access. The number of remote access users also affects the cost component of dial-up networking. Each address assigned has to be unique. You therefore have to ensure that the static address pool configured for the RRAS server does not overlap with the address range defined for your DHCP server. For multiple RRAS servers, the static address has to be unique for each RRAS server. 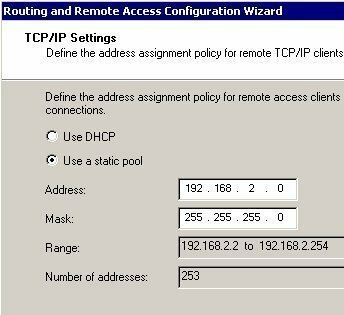 Configure the RRAS server to request IP addresses for clients from a DHCP server: This method is more feasible than using a static address pool. Remote access clients can be assigned IP addresses from the range of IP addresses already configured for the DHCP server, thereby eliminating the possibility of conflicting IP address assignments. Whether multilink connections need to be supported. The number of remote access users who would simultaneously need to access the network. The available number of IP addresses. The bandwidth available on the connection of the RRAS server to the LAN. You can allow/disallow remote access for individual users. You configure individual user access through the Properties dialog box of a specific user, on the Dial-in tab. The Active Directory Users and Computers management console is the tool used to access the Properties dialog box of a specific user. You can allow/disallow remote access by configuring remote access policies. This method allows you to specify remote access rights based on various criteria, such as users, group, and time of day. The settings specified on the Properties dialog box of a specific user, on the Dial-in tab dictates whether a user is affected by a Remote Access Policy. Deny Access: the user is denied to remotely access the network. IP addresses for PPP connections and static routes. A transmit network is a public network such as the Internet. Data moves over the public network toconnect to the remote network. A VPN client creates a connection to the gateway configured as the VPN server. The Routing and Remote Access service (RRAS) is used. Establishes whether requests are permitted. Authenticates requests to connect to the VPN server. Forwards traffic between the VPN client and the corporate network. Assign IP addresses to clients, either through static address assignment or through the DHCP protocol. A VPN tunnel is a connection that encrypts and encapsulates data. The term used to describe data which is being sent over a connection is tunneled data. Place the VPN server on the private internal network: For this placement strategy, the firewall has to allow traffic to the VPN server. It is recommended to connect the interfaces on the private network to a high-capacity switch. Set devices to 100 Mbps Full duplex. For a multiprocessor computer, bind a processor to each network adapter card. It is always better to double the processor speed rather than doubling the number of processors. 512 MB of RAM is sufficient for 1,000 simultaneous connections. An additional 128 MB of RAM (above the standard RAM capacity for the server) is required for each 1,000 simultaneous calls. A further 128 MB of RAM should be added for remote access and services. Whether IPSec is needed as well. L2TP can be used with IPSec to provide encryption. If you need authentication for the VPN server and the client, then you need to be able to support L2TP. Only L2TP over IPSec can provide data integrity. You need to configure remote access policies that allow wireless users to connect to the network. If you are going to configure your WAPs for RADIUS authentication, you should deploy a second IAS server and configure it as a backup to the primary server. This would enable wireless clients to continue establishing connections when the primary IAS server is unavailable. All WAPs and clients should support the same protocols. All your WAPs can use the same server for authentication if you are using IAS authentication. Each WAP must be included in the list of clients on the IAS server. Each WAP must be configured for RADIUS authentication. Kerberos Version 5: This is a standard Internet protocol that can be used to authenticate users and systems. NT LAN Manager (NTLM): This protocol is mainly used to authenticate computers in Windows NT domains. Secure Socket Layer/ Transport Layer Security (SSL/TLS): SSL/TLS is used for authentication when Web servers are accessed. .NET Passport Authentication: Used to authenticate Internet, intranet and extranet users for IIS 6. Challenge Handshake Authentication Protocol (CHAP): This is a challenge-response authentication protocol used for PPP connections. Microsoft Challenge Handshake Authentication Protocol Version 2 (MS-CHAP v2): Provides mutual authentication and is used for network and dialup authentication. Password Authentication Protocol (PAP): A network and dialup authentication method that uses plain text passwords and no encryption. Shiva Password Authentication Protocol (SPAP): This method uses a non-complicated password authentication protocol. Extensible Authentication Protocol (EAP): Used for network and dialup authentication, and for authentication for PPP connections. Extensible Authentication Protocol-Transport Level Security (EAP-TLS): Uses mutual authentication together with smart card certificates. Protected Extensible Authentication Protocol (PEAP): Used to increase the security of wireless network encryption. MD-5 Challenge: Enables EAP authorization through a name and password combination. Right-click the particular domain whose functional level you want verify, and select Raise Domain Functional Level from the shortcut menu. You can view the existing domain functional level for the domain in Current domain functional level. Right-click the particular domain whose functional level you want to raise, and select Raise Domain Functional Level from the shortcut menu. Use the Select An Available Domain Functional Level list to choose the domain functional level for the domain. No encryption: This option is generally not recommended because it allows unencrypted VPN connections. Strong encryption: A 56-bit key is used for encryption. With IPSec, DES is used for encryption. Click Start, Administrative Tools, and then click Active Directory Users and Computers to open the Active Directory Users and Computers management console. In the console tree, expand the domain that contains the user account that you want to enable remote access for. In the right pane, locate the user account that you want to configure. Right-click the specific user account and then select Properties from the shortcut menu. The Properties dialog box of the user opens. In the Remote Access Permission area, click the Allow Access option. In the Remote Access Permission area, click the Control Access Through Remote Access Policy option. From the File menu, select dd/Remove Snap-In. When the Add/Remove Snap-In dialog box opens, click Add. When the Add Standalone Snap-In dialog box opens, select Certificates from the available list and click Add. Click Close to close the Add Standalone Snap-In dialog box opens. Click OK in the Add/Remove Snap-In dialog box. In the Certificates console, in the console tree, expand Certificates. Click the Action menu, and select All Tasks, and then Request New Certificate. The Certificate Request Wizard launches. Click Next on the initial page of the wizard. For the type of certificate to request, click Computer and click Next. Specify a name and description for the computer certificate, and then click Next. Click the Action menu, and then select New Remote Access Policy. The New Remote Access Policy Wizard launches. Click Next on the initial screen of the New Remote Access Policy wizard. On the Policy Configuration Method page, select the Use the wizard to set up a typical policy option. In the Policy Name field, provide a name for the policy. Click Next. On the Access Method page, select the Wireless option. Click Next. On the User or Group Access, select the Group option, and then click the Add button. Specify the group, and then click OK and Next. Select the Smart card or other certificate option and then click Next. 139 queries in 0.303 seconds.